Desperate Dan's Dungeon is a platform game that was released by Thor for the BBC Micro in 1984; as with MRM Software's Bananaman (which was released in the previous year), it has no connection with D. C. Thomson and Co.'s comic character of the same name (who appeared in all issues of The Dandy from its inception in 1937 until its demise in 2012). 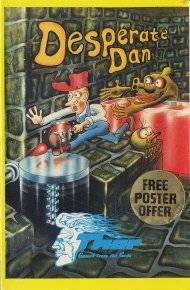 The player takes control of the eponymous Desperate Dan, who has created some ghastly monsters by accident, and must now keep them from stealing the food in his dungeon by holding them behind walls filled with pure liquid Dartanium (which has been specially formulated by Dan, and can only be produced and collected from a large machine at the bottom-right of the dungeon) - but there are also several smaller monsters in the dungeon, that drink the liquid Dartanium from the protective walls, so Dan has to travel up on an elevator and shoot them by walking to the back of one of the three cannons (but if he is hit by a monster, the game shall immediately end). Energy sacks will also randomly appear and Dan must collect them when they do; however, their high voltage combined with the dungeon's dampness can have some strange effects. Z, X and *: Use these keys to make Dan walk left, walk right, and jump; when an energy sack appears, you must collect it if a monster is flying up towards the platform it is on, because it shall block the cannons' shots at the monster. After killing a monster, Dan has to go to the Liquid Dartanium machine to fill his mug, and take it up to the protective wall that the monster had been drinking out of to refill it (however, you can only do this while the three laser beams in front of the walls are deactivated for they will also immediately end the game if touched) - and if the elevator crushes Dan against the top of the screen while he's on it, it too shall immediately end the game. S: This key toggles the audio on and off; you can also press Space to restart at game-over. This page was last edited on 11 December 2017, at 17:00.